Wild, untamed lands hold a wealth of mystery and danger, providing the perfect backdrop for heroic adventure. 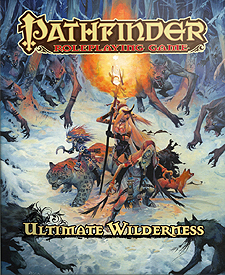 Whether adventurers are climbing mountains in search of a dragon's lair, carving their way through the jungle, or seeking a long-lost holy city covered by desert sands, Pathfinder RPG Ultimate Wilderness gives them the tools to survive the wilds. A new 20-level base class, the shifter, puts animalistic powers into the hands - or claws- of player character options, spells, and of druidic sects and rituals, as well as new archetypes, character options, spells, and more, round out the latest contribution to the Pathfinder RPG rules! Archetypes for alchemists, barbarians, bards, druids, hunters, investigators, kineticists, paladins, rangers, rogues, slayers, witches, and more.